Wild & Precious: $40 CSN Gift Certificate Giveaway! $40 CSN Gift Certificate Giveaway! This Giveaway is now closed. Congrats to #50 -- Mel. 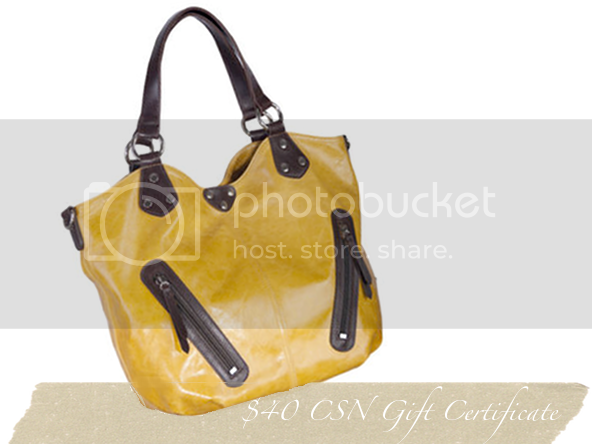 I was so excited when CSN contacted me offering my readers a $40 gift certificate to ANY of their stores! Thats right -- any of their 200+ stores! You can choose from bedroom furniture sets, shoes, luggage, cookware... basically anything your heart desires! Check out all the stores to choose from HERE. I am a follower and love your site. I adore the yellow bag you featured. Yes I am a follower!!!! Your site is so fun and delightful! I love David's Art & your profile Blair! I am a follower of course! Pretty cool stuff...CSN has lots of amazing lighting choices.. I definitely follow you, lady! I could really use some bed side table lamps! Ours brok in the move. I would like to get the Black & Decker Toaster Oven to replace my dying one. I would buy the le Creuset skinny grill at CSN. I would love to own the Le Creuset Stainless Steel Roaster Set. This would be such a help with my cooking. I would buy my new little grandson a John Deere bookshelf. I think I could use a beanbag chair thing. cdziuba@aol.com I'd either get the Rachael Ray Lime Green 12" Skillet, or I'd put the money toward the Landmann Fire Pit with the stars and moons cutouts. Thanks for the chance to win. Sign me up lady! I'm a follower!! Would spend it on...prolly housewares. They have amazing Le Creuset that I never wanna pay full price for!! ps- stop by and enter the Cupcake Challenge. It's hilarious!! I need a new cooler, and they seem to have a few to choose from so I probably would use it on that if I won. I would get the Office Star WorkSmart Task Chair. I need a new office chair. I would get baby layette items since I am due in January! I would get the Hamilton Beach Stay of Go slow cooker because I brike mine. I've been wanting a bean bag chair. They have lots of cool ones! I would spend the money on a new blender. I might get the Paula Deen 5 piece Soup and Stew set. I would probably put it towards a mattress pad, or sheets or to go in another direction a pair of shoes. We're redoing the guest bathroom and they have great fixtures. We could put this toward that. Following on google friend connect as kycouple2000, entry one. Following on google friend connect as kycouple2000, entry two. Following on google friend connect as kycouple2000, entry three. I need a new carry-on bag or travel, so I would start in the luggage department. Thanks for the entry! It would totally go towards a Kit-Cat Clock. I like the Aerosoles Question. I would definitely buy myself a new purse. Mine has seen better days. I really need a new lamp! I think I would get the KidKraft Prairie tea set and kettle. I would buy the classy and chic Dyeables Flame in Silver Glitter shoes! I'd spend it towards a new clothes dresser. I need something pretty for the Summer so I'm going for the Original Dr. Scholl's Vally in Pink. Thanks for the giveaway. Ooh, fab giveaway! I will pass though because I have won a few giveaways lately. I would buy the Hamilton Beach FreshChop Food Chopper. It's scorching here and I'm torn between a big fan and an ice cream maker! I like their cookware! the 1 qt paula deen saucepan is nice. I'd love to get one of the Rachael Ray Porcelain Enamel 12" Open Skillet in Blue - 13481. I'd most likely spend it towards PEM America Fireman Twin Quilt with Pillow Sham - QS3746TW-2300! school supplies! Yup... they have binders & backpacks & more! 3)Following the blog via GFC. I would love to have the le creusset skillet in cherry red. So many fabulous hand bags... definitely want one of those... $40 dollars would certainly help. Oh!!! I am also a follower of your fabulous blog! I'd get the emile henry pink pie dish! I'd probably put it toward some outdoor lighting fixtures. They have a great selection. Oooh yes please, I've been eying their lighting. Definitely would love to win! I would buy some new bath towels & accessories. I would spend the $40 on the Texas Shelf with pegs! Im a sucker for shoes. So I would either spend it on shoes but then again I could buy my dogs something. Either way put my name in the drawing. Neonetics John Deere Neon Framed Tin Sign would be a huge hit with hubby. I'm desperate for a new mattress pad. I'd shop CSN Stores for the Down Inc. Tencel Mattress Pad - 5020. I follow you with Google Friend Connect (#1). I follow you with Google Friend Connect (#2). I follow you with Google Friend Connect (#3). I think I would put it toward a new mattress topper! Thanks so much for the chance at winning! I am a Google Friend Connect follower! Entry #1 - Thanks! I am a Google Friend Connect follower! Entry #2 - Thanks! I am a Google Friend Connect follower! Entry #3 - Thanks again! I am in desperate need of some new bed linen, so I would choose the Wildon Home 600 thread count solid sateen sheet set.